There’s tons of fun to boot-y with preschool favorite Timmy in the all-new release Timmy Time™: Timmy Finds Treasure, now available on DVD from Lionsgate and HIT Entertainment. Come aboard and yo-ho-hold on as the loveable lamb gets his pirate on in five treasure-filled episodes that arrrrrr sure to entertain your little swashbuckler again and again. With slapstick humor and not a single line of dialogue, Timmy Time follows a day in the life of barnyard preschoolers. With diverse animal characters along with a rich and colorful nursery school backdrop, Timmy and his friends learn life lessons that every preschooler needs to know. Timmy Time is part of Disney Channel’s Disney Junior programming for kids ages 2-7 and their families, which airs in more than 99 million U.S. homes. The show is created by Aardman Studios, the Academy Award®-winning creators ofWallace & Gromit™ and Shaun the Sheep™. Ahoy! There’s LOOTs of fun to be had with Timmy and his mateys in this collection of woolly tales! Timmy practices his pirate captain skills, accidentally leading his crew to special treasure. There’s mis-arrrdventure on the hunt for treasure and the crew must get creative to get back on course. Then when Timmy sets sail, he and his friends cause chaos on the seas. 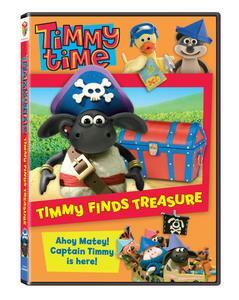 Join Timmy for some swashbuckling fun and see that good mateys are the best treasure of all! Grab your rubber ducky and get ready to soak in some lamb-tastic good fun as preschool favorite Timmy Time™ returns for an all new family-friendly, good-hearted release, Timmy Time: Timmy Needs A Bath, now available on DVD from Lionsgate and HIT Entertainment. Head Back To School With GLEE and Some Tasty Treats!